by Chris Woodford. Last updated: December 3, 2017. Cough, splutter, chug, choke—is the way cars have been till now. Humm, whirr, whiz, glide—is the way they'll probably be tomorrow. Sooner or later, whether it's in a couple of decades or a distant century, oil-based fuels will be far too precious to squander on the world's dwindling fleet of gas-powered cars. That's when a confident majority of electric car drivers will peer back over the shoulder of history to a time—the twentieth century—when automotive technology took a drastic wrong turn. At least, that's how many people think the story will go. Electric cars use older technology than gasoline cars and, in their late-19th-century infancy, looked set to rule the world. The first electric car was built in 1834 and by 1900 some 38 percent of all cars were electric (according to Seth Leitman's book Build Your Own Electric Vehicle, p.34). But oil was cheap and abundant and, in many ways, offered a better method of powering fast cars over long distances. Henry Ford's mass-production of affordable gas-powered cars soon put paid to electric dreams. Fortunately, as people finally woke up to the environmental and economic drawbacks of petroleum in the late 20th century, technology turned full circle and cars powered by the zap of electricity started to return to our streets. But is it really inevitable that all cars will go electric? How long will it take? Before we can consider that question, it helps to ask something much more fundamental: how exactly do electric cars work? What's so good about them anyway—and what are the drawbacks? Can you really go to work powered by a few buzzing electrons? Let's take a closer look! Photo: The world's favorite hybrid car, the Toyota Prius. Many electric cars use power produced from dirty fossil fuels, but they're still at least as "green" as the best gasoline cars and likely much better if the power comes from renewable energy sources like these solar panels. Picture by Mike Linenberger, courtesy of US National Renewable Energy Laboratory (NREL). Electric cars are child's-play; I know that, for a fact, because I built my first one at the age of eight. Now, admittedly, it wasn't a Tesla Roadster or a Chevrolet Volt, but it had all the key features of any electric car. It was a toy I'd made with a construction set using a battery, electric motor, four little rubber-tired wheels, and a simple transmission built from ready-made gears. Real electric cars aren't much more than this, though building one is certainly more of a technical challenge than snapping together a toy. Photo: Many people's ideas of electric cars are still based on vehicles like the famous experimental GM Sunraycer, which looks amazingly futuristic—but is now over 30 years old. The whole of the back section (everything to the right of the white cockpit) is covered in thousands of silicon and gallium arsenide solar cells, while the driver sits in the pod at the front. Sunraycer won the 2000-mile World Solar Challenge race in the late 1980s. Picture by Warren Gretz courtesy of US Department of Energy/National Renewable Energy Laboratory (DoE/NREL). So.... electric car or gasoline? Both have their advantages; both have their drawbacks. That's why many of the electric cars on the road today are actually hybrids that incorporate both technologies side by side: they have a smaller than usual gasoline engine suited to nippy highway driving and an electric motor for all that stopping and starting in the city. Hybrids come in various different flavors. In parallel hybrids, the engine and the motor both send power to the wheels; in series hybrids, only the motor powers the wheels, while the engine simply drives the motor like a generator, recharging the batteries. Full hybrids have powerful enough electric motors and batteries to drive the engine independently, while in mild hybrids, the motor is too puny to power the car by itself and simply assists the engine (or allows it to switch off when the car is idle in traffic). Ordinary hybrids charge up their batteries using power from the engine and energy recovered from the regenerative brakes (which we'll come onto in a moment); plugin hybrids can also be "refueled" from a charging station or domestic power supply, have much bigger batteries, and can be driven by the motor and batteries alone, so work more like conventional electric cars. Whatever the coupling of engine and motor, the basic idea is to combine the best of both worlds to boost fuel economy. The big drawback of a hybrid is that its around 20–30 percent more expensive than a comparable gasoline model. It's likely to be 10 percent heavier (despite its lighter engine, it has an electric motor, batteries, regenerative brakes, and all the rest) and have more sluggish performance. But hybrids score far better on both safety and fuel economy than gasoline cars, which makes them popular with eco-conscious families who prize their green credentials. How does a plug-in hybrid work? A hybrid car is like two cars in one: it has a conventional gasoline (petrol) engine for fast freeway driving and an electric motor for more economic, pollution-free travel (or idling). In different designs, the wheels are driven by the engine, the motor, or both together. Gasoline pump is the car's primary source of energy. Engine powers wheels through conventional gears and transmission. Electric power outlet connects to car's batteries through a conventional plug-in power lead. Batteries charge up overnight while car is parked. The battery pack is usually stowed out of the way behind the rear seats. Electric motor uses power from batteries to drive either two or all four wheels. Regenerative brakes: generator slows down the wheels and returns otherwise wasted energy to the batteries. Cars powered by fuel cells are also electric, though they use tanks of hydrogen to generate electricity and power an electric motor instead of banks of batteries. You can read more about them in our separate article on fuel cell cars. Photo: It's not rocket science—or is it? NASA had to use electric car technology to drive its Apollo Lunar Roving Vehicle (sometimes called the Moon Rover) because there's no air on the Moon to power an internal combustion engine. The Lunar Rover was driven by four electric motors, one for each wheel, all powered by two 36-volt batteries. It's pictured here in 1972, during the Apollo 17 mission, being driven by astronaut Gene Cernan. Read more about the technology inside the Apollo Lunar Roving Vehicle. Picture courtesy of NASA on the Commons. Gas-powered cars and electric ones have a great deal in common and the key differences are the stored energy they use (gasoline versus electricity), the machine they use to convert it into kinetic energy (an engine or an electric motor), and the way the stored energy powers that machine (through a gearbox and transmission, in the case of an ordinary car, but often more directly in an electric car). Let's examine the two key components of electric cars—the motor and the batteries—in a bit more detail and compare them with what we have in a conventional car. Motors are quite different from gasoline engines—and not just in the fuel they burn. An engine needs to spin round relatively quickly to work efficiently (usually thousands of times a minute), but a car's wheels seldom need to go anything like that fast. The power an engine can produce at any given moment may be very different from what the driver needs. For example, if you're moving off from a cold start, or a traffic signal, you need the engine to produce a great deal of force (torque as it's called) at a relatively low speed, whereas if you're overtaking on a speedy highway, you'll need the opposite: more speed and less torque. There's not a great deal you can do to control the output from a car engine because it's a chemical machine, driven by an essentially simple chemical reaction between fuel and oxygen that produces useful mechanical power. In that respect, an internal combustion engine is just like the external combustion engine you'll find on something like a steam engine. If you want more power, you need to burn more fuel more quickly—a basic law of physics called the law of conservation of energy tells us that—which is why operating a car's accelerator is informally called "stepping on the gas": burning gas faster makes more power and ultimately delivers more speed. Apart from the accelerator (supplying more or less fuel), the other two key controls of a conventional car engine are the gears (transforming the power coming from the engine so the wheels turn quickly with low force or slowly with high force) and the clutch (briefly engaging or disengaging the engine's power from the gearbox altogether). And we need the gears and the clutch because of basic limitations in how an engine works—as a machine that enjoys spinning around thousands of times a minute, however fast you're driving (the engine keeps turning, burning fuel and costing money, even if you're stopped at a traffic signal). The motor in an electric car is very different: up to a point, it has no "preference" whether it spins fast or slow—it's pretty good at delivering the same torque at any moderate speed. If you had an electric train set when you were young, you probably controlled the engine with a transformer that had a dial you could turn up or down. Starting off, you'd have the dial turned down low to make the train move slowly (by feeding a relatively small electric current to the motor inside it); you could go faster simply by turning up the current to make the motor spin more quickly. There's no clutch in a toy train and (usually) no gearbox either: the electric motor drives the train wheels directly, and does so equally well whether the train is going fast or slow. Artwork: A (very!) 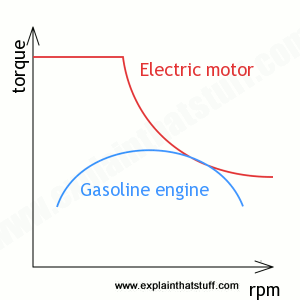 rough indication of how torque varies with speed (engine rpm) for electric motors and gasoline engines of comparable power. Electric motors produce maximum torque right from the off, whereas gasoline engines need to pick up quite a bit of speed to deliver maximum torque. In theory, an electric motor can drive a full-sized electric car just as simply as a toy train, without the clumsy old gearbox and transmission you'd use in a conventional gasoline-engined car. In practice, electric cars are clearly more complex. Toys are small and move fairly slowly, while real cars are much bigger and go faster. When a real car corners, its two outside wheels are traveling around a curve of bigger radius than its two inside wheels but in exactly the same time, which means they have to spin slightly faster. (The same is true of toy cars, but the effect is too small to notice.) That's why real cars need complex transmissions with speed-adjusting gears called differentials that allow one pair of wheels to go at a slightly different speed—faster on the outside of a curve, slower on the inside—than the other. The same happens in an electric car when it goes around a corner, and that rules out any kind of simple transmission (for example, a single electric motor driving the two back wheels from a common axle). One solution is to have a front-located electric motor driving the same kind of transmission as an ordinary gasoline car, using a driveshaft (propeller shaft) and differential in the usual way. Another is to do away with the driveshaft and have a motor, gearbox, and differential unit between two of the wheels (either front or rear) and driving them both. A third option is to have two front or rear motors (with or without gearboxes), each driving one wheel independently. The final option is to use two or four hub motors (in-wheel motors), which are motors built into the wheels themselves. That raises a different technical issue: how to build a motor that's lightweight, compact, and still powerful enough to drive a car (although if there are four hub motors, you need to generate only a quarter of the total power with each one). 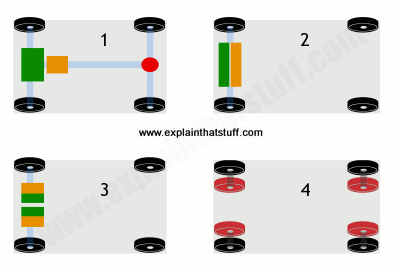 Artwork: Transmissions: How does power get from the motor to the wheels? 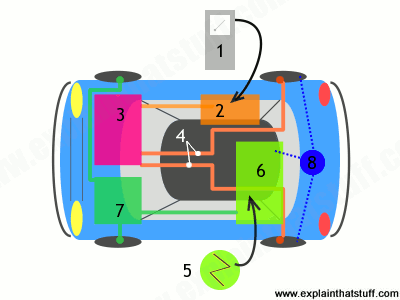 Four example arrangements of the electric motor (green), gearbox (orange), differential (scarlet), driveshafts (light blue), and hub motors (red) in an electric car. 1) In this arrangement, the electric motor powers the car much like a traditional engine through a gearbox and driveshaft. 2) A central motor powers both wheels through one or two gearboxes. 3) Two separate motors power two wheels through separate gearboxes. 4) Hub motors power two (or sometimes all four) wheels with no other gearboxes, driveshafts, or other transmission parts. Every car is an electric car inasmuch it uses a battery to get the engine spinning when you first start off. Historically, cars were the pioneers of rechargeable batteries. Long before we had laptops and cellphones, windup torches and all the rest, back when most of us routinely used batteries one minute and threw them away the next, cars were demonstrating the possibility of using batteries over and over again. The only trouble was, car engines used big and heavy lead-acid batteries that weren't good enough to power vehicles at high speeds, over long distances, for long periods of time. Photo: In a Tesla, the lithium-ion batteries are stowed in this compartment at the rear. Photo by courtesy of Steve Jurvetson, published on Flickr in 2007 under a Creative Commons licence. Today's electric cars mostly use lithium-ion batteries, exactly the same technology you'll find in your laptop or ebook reader. They're relatively light, fairly good at storing useful amounts of power for their weight, last several years and hundreds of charges, and perform reasonably well at the varied range of temperatures most car drivers routinely encounter round the world (though not always that well in the extremes you can find even in hotter and colder US states). That doesn't mean they're perfect. The main problem with car batteries is that they still can't carry as much energy as gasoline per unit of mass; in other words, they have a lower energy density. Lithium-ion batteries are likely to remain the popular choice for electric cars for the foreseeable future, though alternatives such as nickel metal hydride (NiMH), which are safer and cheaper, and other lithium-based technologies (including lithium-nickel-manganese-cobalt, lithium-phosphate, lithium-manganese, and lithium-cobalt) are also waiting in the wings. Supercapacitors (also called ultracapacitors) are another promising alternative. A bit like a cross between batteries and capacitors, they offer much faster charging times. 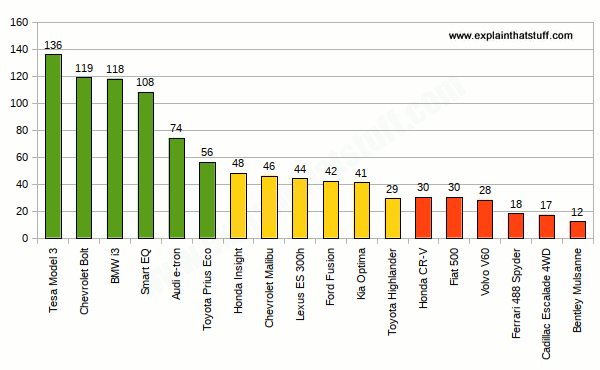 Chart: How much better are electric cars? This chart compares mpge (mpg equivalent) or mpg ratings for 18 cars with 2015 specifications: six electrics (green), six hybrids (yellow), and six gasoline cars (red). Figures are quoted from fueleconomy.gov. Electric cars are considerably more efficient than gasoline cars because electric motors are inherently more efficient (about 80 percent) than internal combustion engines (a mere 30 percent for the engine alone, much less for an entire gas-powered vehicle), which waste a high proportion of the fuel they burn as useless heat. How do the figures work out in practice? The 2018 Volkswagen e-Golf Automatic A1 (maximum list price $30,495) manages an average (city and highway combined) 28 kWh (kilowatt hours) per 100 miles (equivalent to 126 mpg) for an annual fuel cost of $550 per year, where a 2018 gasoline version of the same car (list price $20,910–$24,755) comes in at just 29 mpg for an annual fuel cost of $1350 per year (figures from fueleconomy.gov). Tesla claim an even bigger difference: an annual 30,000-mile running cost for a Tesla Model S of $1,048 (at $0.12 per kWh) compared to a typical gas car's $5,318 (based on $3.90 per gallon of fuel and 2015 figures). It's not just the engine that makes an electric car more efficient. With regenerative brakes, you're not throwing energy away every time you stop and stop: the car's electric motor becomes a generator so that when the brakes are engaged, the car slows down as your kinetic energy turns to electricity that recharges the battery. David MacKay sums it all up neatly in his book Sustainable Energy Without Hot Air: "Electric vehicles can deliver transport at an energy cost of roughly 15 kilowatt hours (kWh) per 100km. That's five times better than our baseline fossil-car, and significantly better than any hybrid cars. Hurray!" 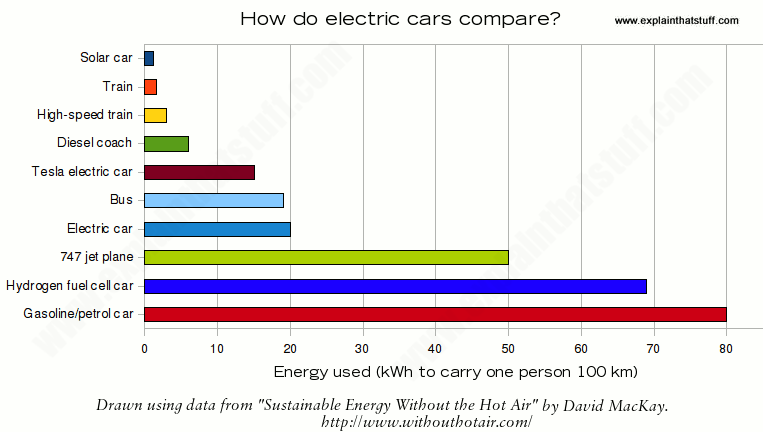 Photo: How efficient are electric cars compared to other forms of transportation? This chart shows how much energy (in kWh) it takes to move one passenger a distance of 100km (~60 miles). Solar cars (tiny one-person experimental vehicles powered entirely by solar panels, like the Sunraycer pictured up above) are most efficient, largely because they weigh so little: most of them don't even have batteries. Electric cars come midway on the scale, though some (such as the Tesla) fare better than others. Gasoline cars are worst by far (largely because of their heavy engines and transmissions) and hydrogen fuel-cell cars aren't much better. Note how very efficient trains and buses are, even though they use conventional technology. That's because they carry large numbers of people and, as thin tubes moving through the air, are relatively aerodynamic. This chart (very gratefully) reuses data calculated and explained by Prof. David MacKay in chapter 20 of his superb book Sustainable Energy Without the Hot Air. Follow that link to read how science can help us make transport more efficient. Even in performance, electric cars sometimes outclass gasoline ones. As we've already seen, electric motors can produce high torque even at low speeds, which means they can accelerate more quickly than gasoline cars that don't produce their peak torque until they reach relatively high engine speeds. They're also quieter and smoother. As Tesla have demonstrated, there's no reason whatsoever why electric motors and batteries—once thought of as dull, worthy, and rather plodding— can't power racy, exciting sports cars. A Tesla Model S can accelerate from 0–60mph (100km/h) in just 3.9 seconds, comparable to a high-performance gasoline-powered BMW M5 (and in at least one test, by Automobile magazine, rather better). Size is no obstacle for electric power either. Diesel-electric trains (in which diesel engines power electric motors that provide the traction) have been around for years. In November 2014, truck manufacturer BelAZ announced a super-powerful new 500-tonne diesel-electric mining truck in which four giant AC motors are powered by two 16-cylinder diesel engines. Maintenance is also less of a chore, because electric cars are generally simpler than gasoline ones. According to a 2012 report by the Institute of Automobile Economics, electric vehicles cost about a third less to maintain than equivalent gas or diesel cars. Why? An electric motor is an inherently simpler bit of kit than a gasoline engine with far fewer moving parts to wear out; if it uses no transmission or gearbox, that makes the entire car simpler still. Even the brakes last longer, since regenerative braking means you need to use the conventional (frictional) brake pads much less than in an ordinary car. On the other hand, some of the technology used in electric cars is relatively untested, which means it could be more prone to early failure even if it is, paradoxically, simpler and theoretically more reliable in the long run. Electric motors and batteries are the two main points of difference between conventional and electric cars. Where motors are well understood and highly reliable, giant battery packs remain the Achilles heel of electric cars. Despite its environmental and economic drawbacks, kilo for kilo, a tank of gasoline can carry far more energy than a bunch of batteries (see chart below)—and that will remain the case for the foreseeable future. You can completely refuel a gas-powered car in a couple of minutes (as long as it takes to fill up your tank) and drive several hundred kilometers on the energy you've pumped in without stopping. But electric cars can take anything from half-an-hour to a whole night to recharge ("fill up") and, even then, probably won't get you further than a couple of hundred kilometers before the batteries run flat. Where a gas tank is a relatively compact thing that sits neatly out of sight, the batteries in an electric car are expensive (about a quarter of the cost of a Tesla, which still works out at around $20,000), bulky, heavy, and take up room you might use for other things. Chart: Why we still drive gasoline cars—in a nutshell. Kilo for kilo, gasoline can carry far more energy than batteries. Hydrogen is a much better energy carrier, but there are significant problems in making and storing it. Coal scores highly too, but it's dirty and impractical: steam cars disappeared long ago! Everyone who owns a cellphone or a laptop powered by lithium-ion technology will be fully aware that rechargeable batteries don't last more than a few years (even less if you treat them badly)—and they can fail with little or no warning. In an electric car, there are banks of batteries, not just one or two cells, so you're less at the mercy of a sudden failure and more likely to find a gradual deterioration in range with the same charging time. Since batteries are so expensive and remain the biggest questionmark in electric cars, manufacturers have done their best to reassure buyers with warranties of around 8–10 years (or 100,000–125,000 miles). Research by the US National Renewable Energy Laboratory (NREL) suggests current batteries could be made to last 15 years and a 2013 meeting of the American Chemical Society heard that batteries might well last 20 years, which is probably the maximum lifetime of most cars. If that sounds impressive and reassuring, bear in mind that many of us buy our cars secondhand (already several years old) and it's far from uncommon to drive around in a car that's 10 years old or even more. Another critical factor is that battery life depends on temperature: using rechargeable batteries in hotter climates (which includes states like Arizona and California, if experiences with the Nissan Leaf are anything to go by) can halve their lives. The only sensible answer about batteries comes from Jeff Cobb of HybridCars.com, whose excellent article How Long Will An Electric Car's Battery Last? reviewed all the evidence and concluded "Ultimately it is too soon to tell." Photo: Batteries have always been the stumbling block in making successful electric cars because they carry energy less effectively than gasoline. 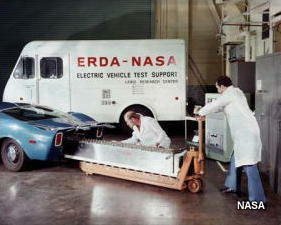 Here, gigantic nickel-zinc batteries are being loaded inside a prototype electric car by NASA engineers in 1977. Picture courtesy of NASA Glenn Research Center (NASA-GRC). The higher energy density of gasoline and its relative cheapness are two key reasons why the world still prefers dirty, polluting gas-powered SUVs over clean, green eco machines like the Toyota Prius and the Nissan Leaf. But the sheer convenience of the "oil economy" is important too. Wherever you live, you're never that far from a gas station. Figures for 2014 from the US Census Bureau revealed that there are some 121,446 gas stations across the United States—and that figure is probably about the same today. By comparison, according to the Alternative Fuels Data Center, as of 2018, there are merely 17,387 electric charging stations. Now while it's true that you can charge your car at home (unless you live in an apartment block), or at work (unless your employer is fussy about your stealing electricity), and there are effectively millions of charging points, sometimes you also need to charge up when you're on the road, and so far the world simply isn't geared up for that: if you're driving a car, it's assumed to be a gas-powered one. Having said that, range is nowhere near as big an issue for electric cars as critics like to claim: the US Department of Energy points out that most people's daily commute involves a round-trip of less than 30 miles. Technically, the sky is the limit for electric cars: with help from onboard solar panels, future electric cars might manage 500km (300 miles) or more on a single charge. Photo: Theoretically, you can recharge an electric car anywhere, even at home. But what if you work away, travel a lot, or live in a high-rise apartment? Unfortunately, the world is still not properly geared up for electric cars and charging points remain relatively uncommon. Picture by Keith Wipke, courtesy of US Department of Energy/National Renewable Energy Laboratory (DoE/NREL). While fuel and running costs are lower for electric cars, the initial purchase price is often considerably higher; until it was discontinued in 2015, you could pick up a Honda Civic Hybrid for about $24,735–$27,435, while the comparable gasoline model came in at just $18,290–$24,590 (figures from fueleconomy.gov). Concerns about things like battery life also make it harder for people to take the plunge. Sticking with what you know is always easier than taking an expensive risk. Some countries offer tax breaks for electric cars, but you still have to face that higher purchase price to begin with. Green-thinking environmentalists tend to see this issue in black-and-white: if cars have a future at all (they would prefer more public transportation and greater use of local goods to reduce the need for transportation altogether), it must be an electric one. Even setting aside concerns about emissions, electric cars are certain to become more affordable and economic as oil supplies dwindle. The bigger the demand for electric cars, the more economics of scale will kick in. The more electric cars there are, the better the infrastructure will be, the bigger the choice of models, and the greater the likelihood of hardened petrol heads switching allegiance to the clean and green. It all sounds so very positive, so very inevitable. It's easy to fall for strident statistics celebrating the "astonishing" growth in electric cars (so many hundred percent this year, so many hundred percent next) until you remember that there are still very few electric cars around: 100 percent growth from not very much is not much more. An October 2014 article in Forbes speaks of "skyrocketing" growth in electric cars in the (US) states of California, Georgia, Washington, Michigan, and Texas. In Texas for example, it cites a 128 percent growth in electric cars in just 12 months, which sounds extremely impressive until you look at the actual numbers: there are now 6533 electric cars compared to 2862 previously, but that's less than 1/1000 of the total number of cars registered in Texas (7.7 million is the newest official figure I can quickly find, for 2004, but it's accurate enough to make the point). In California, where Forbes highlights 77,000 registered electric cars, there are still something like 18 million registered automobiles in total (again, that's the 2004 figure), so even in the most fervently supportive state, the proportion of electric cars isn't much better (five in a thousand according to the US Energy Information Administration in 2014). People have been predicting the demise of the internal combustion engine, caused by our surpassing "peak oil" production, for over half a century (especially since the energy crisis of the early 1970s)—and we're still surrounded by a billion gas guzzlers. Improvements in petroleum prospecting and recovery and better car design and efficiency have extended the life of this old technology far beyond what many people thought possible. Is there any reason why, 40 years on, in the middle of the 21st century, we're not going to find ourselves in exactly the same position: a few more electric cars on the roads but the majority of us still rattling round in gas-powered crates? According to 2015 predictions by the US Energy Information Administration, even by 2040, around 46 percent of cars will still be using gasoline only, while another 43 percent will be micro hybrid or flex fuel. A mere 2 percent will be fully electric or plug-in hybrids, 5 percent will be full hybrids, and 4 percent will be diesel. Dramatic environmental damage—a sudden acceleration in climate change or its human impacts—could change everything, but so could a meteorite impact from space or a global epidemic. However rational the arguments in favor of electric cars, and however much environmentalists would like things to be otherwise, the world has a huge attachment to dirty gasoline technology—and that's unlikely to change anytime soon. Electric cars have always been radically modern; from Woody Allen's Sleeper to the 1.21 gigawatt-flux capacitor that powered Marty McFly's DeLorean Time Machine in Back to the Future, they're the very stuff of science fiction. Yet they're science fact too: Apollo astronauts, you might remember, were bouncing round the Moon in the battery powered Lunar Roving Vehicle (LRV) about 45 years ago. No-one knows if electric cars will ever play a dominant role in the future, but they've certainly had an interesting past. Here's a whistle-stop tour of electric car history... so far. I've not covered every invention and inventor; just a few key milestones to give you a flavor! 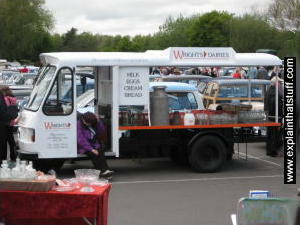 Photo: A typical electric "milk float". The lead-acid batteries are the black boxes stowed in front of the wheels, underneath the main cargo platform. 1800: Italian Alessandro Volta invents the battery (a primitive stack of zinc and silver discs separated by cardboard soaked in saltwater). 1821: English chemist Michael Faraday shows how electricity and magnetism can work together to make a force—the basic scientific principle of the electric motor. 1829: American electricity pioneer Joseph Henry develops a practical motor, though it's still far from a viable machine. 1834: Thomas Davenport develops a viable electric motor and goes on to develop the first battery-powered electric car running on a track. Unlike in modern electric cars, the batteries are not rechargeable. 1837: Robert Davidson of Scotland develops a battery powered car and later (in 1842) an electric train that whizzes along the Edinburgh to Glasgow Railway at a breathtaking 6km/h (4mph). 1859: Frenchman Gaston Planté invents the lead-acid battery, made from nine cells connected in parallel, and demonstrates it to the French Academy of Sciences the following year. 1859: Electricity pioneer and prolific US inventor Thomas Edison develops an electric car. 1881: Siemens constructs the first permanent electric railroad in Lichterfelde, Germany. 1885: Leo Daft uses an electric motor to power a commuter train to 50km/h (30mph) in New York City. 1890: William Morrison develops the first successful American electric car. It can manage a respectable 23km/h (14mph). 1900: German Ferdinand Porsche develops the world's first hybrid, hub-motor electric car (the Lohner-Porsche). 1908: Henry Ford gives his wife Clara a Detroit Electric car as a present after she complains she couldn't start a gasoline car with a hand crank. Later, he buys another one for his friend Thomas Edison as a Christmas present. 1910s–1960s: Ironically, despite Ford's enthusiasm, his development of cheap, mass-produced gasoline cars pushes electric car technology to one side. 1940s–1970s: Electric vehicles are used for little more than powering delivery vehicles, such as "milk floats" (widely used to deliver dairy products door-to-door in the UK before supermarkets take over). 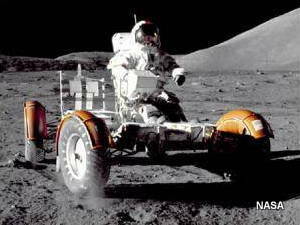 1971: Apollo 15 astronauts David Scott and James Irwin drive the electric Lunar Roving Vehicle on the Moon for the first time. 1976: US Congress passes the Electric and Hybrid Vehicle Research, Development, and Demonstration Act to encourage the production of electric cars. 1990: The California Air Resources Board spurs the development of electric cars with its zero-emission vehicle program. 1996: General Motors begins leasing its pioneering and futuristic looking EV1. Later, the cars are controversially taken back by GM and crushed. 1997: Toyota launches the Prius in Japan—and it soon becomes the world's best-selling hybrid. 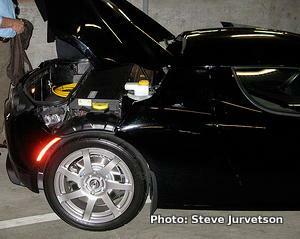 2008: The first Tesla Roadster electric car is shipped to customers. 2013: Toyota announces it has sold over 5 million hybrids worldwide, including 2 million in the United States alone. 2017: European countries, including France and Britain, announce they will ban the sale of new gasoline and diesel cars by 2040. Volvo reveals it will phase out internal combustion engines much sooner, announcing a plan to offer only hybrids or electric cars from 2019. The Great Race: The Global Quest for the Car of the Future by Levi Tillemann. Simon & Schuster, 2016. A wide-ranging account of the auto industry's battles over clean, green cars. Build Your Own Electric Vehicle (Third Edition) by Seth Leitman and Bob Brant. McGraw Hill Professional, 2013. Electric Vehicle Technology Explained (Second Edition) by James Larminie and John Lowry. John Wiley & Sons, 2012. 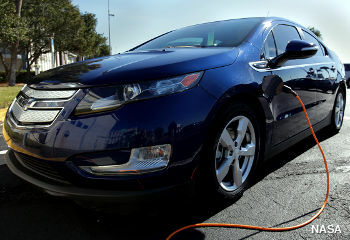 Plug-in Hybrids: The Cars that will Recharge America by Sherry Boschert. New Society Publishers, 2006. The Complete Idiot's Guide to Hybrid and Alternative Fuel Vehicles by Jack R. Nerad. Alpha Books, 2007. Check out the latest electric vehicle articles from The New York Times, The Guardian, and Wired. Electric cars already cheaper to own and run than petrol or diesel—study by Damian Carrington, The Guardian. 1 December 2017. Lower fuel and maintenance costs now make electric cars an attractive alternative, though government subsidies also play a part. Plug-in electric vehicles: future market conditions and adoption rates by Melissa Lynes. EIA International Energy Outlook 2017, October 23, 2017. A fascinating look at different scenarios for the future growth of electric vehicles. Electric cars are not the answer to air pollution, says top UK adviser by Damian Carrington. The Guardian, August 4, 2017. Electric cars don't produce tailpipe (exhaust) gases, but they do make significant air pollution from brake and tire dust. Electric cars will not stem global demand for oil, says BP by Adam Vaughan. The Guardian, January 25, 2017. The energy giant predicts rising demand for gasoline-engined cars, largely because of traffic growth in Asia. Carmakers Forge Ahead With Electric Vehicles by Bill Vlasic. The New York Times. January 6, 2016. Although sales remain small, car makers are now pushing electric vehicles with great enthusiasm. Norway Is a Model for Encouraging Electric Car Sales by David Jolly. The New York Times. October 16, 2015. Even though Norway is one of the world's biggest producers of fossil fuels, it's taking a lead in shifting its citizens to electric power. Bolivia holds key to electric car future : BBC News, 9 November 2008. Will demand for lithium soon outstrip supply? Who Killed the Electric Car? : Interesting Wikipedia article about the 2006 documentary movie charging that GM's EV1 car was "killed" by a conspiracy between traditional car makers, the oil industry, and other vested interests. How to Build an Electric Vehicle: A thorough practical introduction from Frank Didik, who's clearly learned a huge amount from his own experience. Build your own Electric Car! : A step-by-step guide from Instructables. Building an Ultra Light-Weight Car, Part 1: Two great articles in Autospeed describe how the Trev electric car was built by UniSA. So You Want to Build an Electric Car: Mike Chancey presents a short introduction to converting your car to electric power. A $672 electric car, built by two DIYers: Don't want to shell out tens of thousands on the latest e-model? You could always build your own in the manner of Darin Cosgrove and Ivan Limburg, of Brockville, Ontario.